Two contrasting eras meet in the music video for "Modern Age," a track from Triggers & Slips' new sophomore album. Symbols of postcards and trains appear, evoking nostalgia for days when communication ran deeper than texts or online comments—when ramblers could spend their lives riding the rails. But the video is set in present day, and the vehicles aren't rusty antiques—they're sleek, shiny Trax trains. A similar duality is present in the local band's classic-country-influenced 2012 self-titled debut, and Triggers & Slips have always seemed to inhabit two worlds. 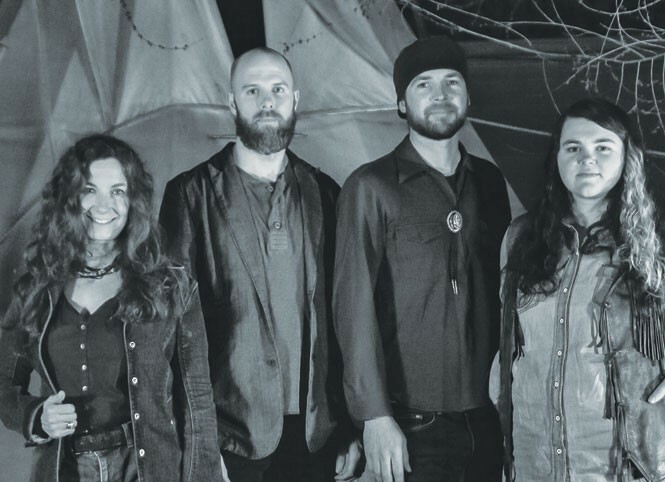 Their twangy, rootsy sound is influenced by legendary country artists and folk singers. "We have a bit of the oldness in us," says co-lead vocalist/guitarist and co-songwriter Morgan Snow. Yet these fans of traditional music don't shun the modern world. They drew on time-tested musical styles to create Buffalo vs. Train, yet the record is still largely about what it means to be present, exploring a crossroads where old meets new. "We were not born in 1950, we're not the Charlie Daniels Band, we're not living in the '70s—we live in 2015. I think pulling from old and new is just something that's our generation," Snow says. "We're one of the last generations that will actually know both." If you catch Triggers & Slips at a local show, you might see the full group perform, but it's more likely you'll watch core members Snow and co-lead vocalist/guitarist/songwriter John Davis, who have also been playing stripped-down versions of the band's material as a duo for the past five years. Buffalo vs. Train features first-time recordings of some of those arrangements, as well as songs the pair has never played with the full lineup. And while Buffalo vs. Train represents a wide range of songwriting periods for Snow and Davis—spacey instrumental piece "The Bridge" was one of the first songs Snow ever wrote, but "Modern Age" and "Stars" are newer—the album is loosely inspired by its title's inherent juxtaposition. "It's the literal interpretation of a wild animal that's free and roams and doesn't have any real purpose other than surviving for itself, and a train, which is the exact opposite but in some ways the exact same thing," Snow says. "It runs, it's born to run and be wild, but at the same time, it's confined to tracks—it's a machine vs. nature-type aspect." Although Buffalo vs. Train is meant to capture the feel of Snow and Davis' duo shows, it's a highly collaborative release featuring contributions from additional local songwriters and musicians. It also includes a few covers of material by Steve Earle and the late folk singer, activist and real-life train-hopping hobo Utah Phillips. Kate MacLeod, who co-produced Buffalo vs. Train, sings backup vocals and adds violin to the mix; Michelle Moonshine Gomez performs her original track "Make You Mine" and sings backup; and Utah Phillips' son Duncan Phillips does a spoken-word piece on a track his father penned, "Phoebe Snow." Their musical collaborators "are definitely our elders," Snow says. "Those are the people that we look up to, and you can learn a lot from people that have handled themselves the way they've handled themselves. They have a lot of grace and a lot of integrity." "It's good to tap into the big tree, the ultimate big tree of music, which is many thousands or billions of years old," Davis says. Buffalo vs. Train was recorded live—songs were often captured in only one take—in a studio Morgan and Davis made to look and feel like a living room. It's easy to hear the chemistry and camaraderie between Triggers & Slips and their guests. Intimate and inviting, the acoustic-driven Buffalo vs. Train provides an overview of Utah's musical past and present. It's also a snapshot of the magic that transpires when a group of modern musicians pay homage to their roots. That unedited immediacy of performing together in the studio is what Triggers & Slips "really wanted to capture" on Buffalo vs. Train, Snow says. "We've been able to have some really good friends and really good parties where we just get to jam and play in the living room, and it's one of my favorite times to play music. ... We want you to feel like you're in that living room with us."